“I Hold The Lion’s Paw” is an eight-piece collective. The music is born out of an organic cross-over of afro-beat, jazz and outré electronics. Expect to hear as much as electro-acoustic noise, slowly evolving soundtracks, afro-beat tinged grooves and psychedelic free jazz. NEW RELEASE CD, Overtone Ensemble, S/Titled. Overtone Ensemble are: Atticus Bastow, David Brown, Philip Brophy and Tim Catlin. Overtone Ensemble create drone-based, immersive soundscapes utilising self-made instruments and bowed and activated metals and glass. A liminal zone where acoustic instruments vibrate with eerie electronic verisimilitude and familiar instruments sound strangely alien. Dense percussive sound fields peal and ring out from re-purposed scuba tanks and massed handbells. Tuned aluminium rods are caressed into reveries of metallic frottage. Fluttering microtonal beats tickle the cochlea and crystalline earworms writhe across stereo space. It’s an album of oscillating and unalloyed acoustic energy - a real Metallic K.O. Longitudes is a live recording of the Overtone Ensemble performing live at the Liquid Architecture Festival. Edition of 100. David Brown, Tony Buck, Magda Mayas Euro tour 2016. June 17: DB & Lukas Simonis: Amsterdam? Shadows gather under cardboard where animal dreams and cello bows struggle to hold off electricity. Sounds of bells are rushed, entangled with rain, through measly slots between tightly crosshatched wires. This fabricates perforated fragments of seeing. These fragments adhere in the air to form a soft abrasive paper, fancied by the remote ones. As a duo Tim Catlin and David Brown come together as 'Helium Clench' and boast long histories in the Melbourne and international avant-garde music world. 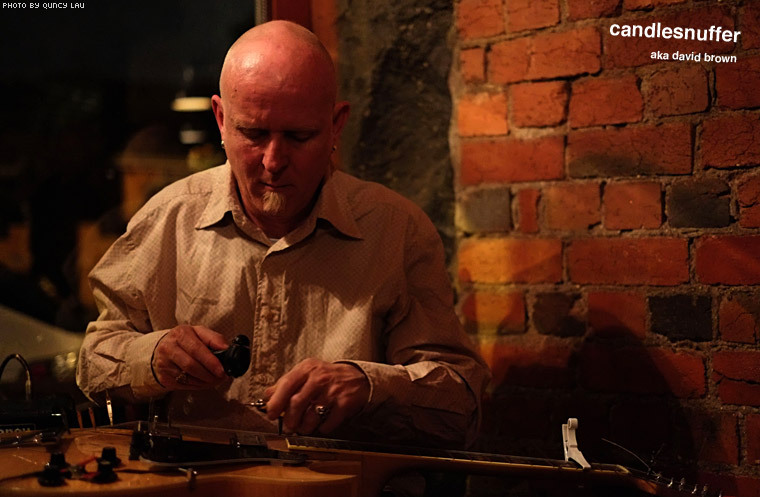 Both have independently developed a fascination with microtonal sound through Catlin's construction of harmonic overtone guitars and alternatively tuned metal rod instruments, and in Brown's case through his explorations using the quartertone bass guitar. 'Sieve', their first duo recording is a studio-based project that amalgamates electroacoustic strategies, bowed objects and processed acoustic and electric instruments. Initial recordings focused on improvisational processes along with bowing of acoustic instruments and found objects, whilst other recordings utilized electronically processed electric guitar beds. All of these recordings were then subject to rigorous studio production techniques to shape the final compositions. Parched twigs muster fish with odd utterances. The hinterland lost in rattled strings scrapes through a season of make it up lunacy. The outputs of the wood-turners fashionings embarrass him, condemned to life as fossils, undiscovered till when? Reflective as wetlands, caught in stone and magnetic tape they pilfer each other's constituents till unrecognisable to themselves. A meeting of musical opposites congeal into an organic whole. The tempered tonalities of Abraham's piano mesh with the atonalities of Brown's prepared guitar and utensils. Through concentrated listening and the implementation of conventional and extended instrumental techniques the resultant tones and textures pull at and morph into each other creating a mysterious sonic world, half here, half there. With combined extensive histories in jazz, improvisation, pop and rock music Chris Abrahams and David Brown together are: 'culture of un'.